Founder of women-only networking platform Sheroes Sairee Chahal prefers to take life by the horns. Challenges, she says, are only screensavers for opportunities. The internet is one of the most enabling technologies of our times and, like many things, women got to it later—men got to it first. It is shaping how we live, work, shop, read, consume, study. A lot of our work uses the internet as a core enabler. At Sheroes, a women-only platform which is also a network of communities, we feel that when communities thrive, members can grow in work, play, and in supporting each other. A lot of our members are home-based workers, working in corporate India, micro entrepreneurs, gig workers, creative artistes, service providers, or thinking of starting up. It is a support network where your community is your safety net. It is a tried and tested model. The only difference is that we are using the internet to enable all this. Being able to talk to someone, validate your ideas, share your journey, makes us stronger. There are so many women who have found their voice, their professional identity, are driving passion projects, and making a difference. Take for instance, Simran Oberoi. She is a home chef and has worked in the corporate world. Healthy baking is a passion for her so she converted herself into a big evangeliser of healthy baking. Today she runs an online store, conducts workshops and passes on her knowledge as a community champion. Ramanpreet in Punjab has found confidence to share her poetry with the community. Sathiya Sundari is from a small village in Tamil Nadu and has had a difficult life. She had to leave her home after years of abuse. She trained herself to set up a beauty parlour. Now she is an icon in her village and is helping others find their feet, all this with the help of the community. Akriti Mattu lives in Bangalore, she is a travel blogger and inspires women to use solo travel as a means of discovery. Alka Goenka from Nepal lives in a traditional family. Food is a passion for her and she uses the community to chart her next course: write a book or run a small business. I grew up a bookworm only because the internet was not there and there was nothing on TV. It was a slower time and we didn’t have much to do, so I found my refuge in books. I also hung out with my dad who is an engineer, tagged along with him to factories and the office, listening to grown-ups talk, pretending to type on the typewriter. Reading gave me lot of depth and perspective. I would read everything that I could lay hands on. Those days books were not as readily available; we didn’t have the kind of thriving publishing environment as we do today or even the range of authors. Then I went to JNU, found a totally different world and interestingly also discovered the world of start-ups. I built my first start-up in 1999. Having a rich perspective without taking sides is a blessing. On the one hand we are building a very competitive, consumer-tech company; at the same time we are never going to let go of our empathy, our values and who we serve—that continues to anchor us. Growing up in a middle-class family, with a contained upbringing, you learn the value of resources: That is core to how I run the company and who I am. There is not much to lose. Life only moves forward. There are enough fall-backs and these options have only grown. These are good times, where technology is thriving. I could go back to find something more stable, less uncertain, but I have to be true to who I am and what drives me. I need to take risks. I’m not afraid of failure or difficult problems, but I’m very afraid of boredom and falling into a comfort trap. That’s something I don’t want to do. In spite of all the failures and challenges, the rewards still outweigh everything else. Your learning curve is much faster. What more could you ask for? If I was doing it all over again, I’d just be more aggressive, I’d take a shot at bigger goals, do more, take more risks, not less. A challenge is like a coin: You have to look at what is on the other side. It may seem to us that it is a difficulty but it is always an opportunity. It has a lesson, it makes you a better person, it brings something with it, which is what you need at that point. Challenges are screensavers for opportunities. I built my first start-up (a newspaper for sailors) quite by chance. I was not aware of the problem statement until I met someone who was a lifetime sailor and was about to quit sailing. He told me that one of the biggest challenges in the industry is sailor depression. Sailors are away from home for six-seven months at a stretch and have no access to news from home. Traditionally news came from Voice of America and BBC news capsules. That was the problem statement. We put a product together that brought good news from home, using technology. It was beamed via satellite, printed on the deck and distributed—it was a new model for news delivery! Sometimes when I’m in a room, I’m literally the odd one out for many reasons: I’m the youngest, or the only woman, or the only one not having a family around the table, the only non-tech founder running a tech company—it happens on an everyday basis. Lot of people undergo a similar sentiment in other rooms. However, I am cognisant of the fact that at least you are in the room. Many people would not be even counted in the room. Somewhere you start looking at it with a different lens, and take a more constructive, pragmatic approach. I see my company as a major mission. We are not the only ones who understand that gender gap is a reality in India and it is a major problem and is going to stand in our way. Our approach to solving that is different. What we are doing is putting more power in hands of the user. We are creating products that our users can use and find their own roads that will bridge the gap, create more inclusion, that will create more opportunities. There is undue pressure on women to keep the balance, make peace, not to have aggressive ambition, not tread in uncharted territories. Women generally are more guilty: That’s what we are taught to be. Over a period of time I’ve learnt not to be guilty about my choices or the sense of imbalance I live with. These are all choices in our hands, these are our calls and we have to be responsible for our own actions. I don’t care about what people say or how they will think of me. Being able to ignore is a life skill. If you pay attention to everyone who is going to pull you down then you are distracting yourself. Life is short, you don’t get the same opportunity twice, you have to move on faster than what people come to you. Keeping your energy and motivation high is your initiative. I believe in energy zones, in energy environments. One needs to be mindful of energy vibes of your own and your environment. Being able to ignore negativity is important, irrespective of where it is coming from. I have always been aware of it and now I’m far more conscious of it. I protect my energy zones vehemently. I have my own schedule. I call it my Hour of Power: 20 minutes meditation, 20 minutes yoga, 20 minutes reading something nice or listening to a podcast. It is a fuel-up for the day. You need to invest in yourself. We keep charging our phones; we need to charge ourselves too. I thrive with my work, it keeps me going. And my daughter, who is a young little woman, challenges me a lot—she is a strong, opinionated person. My family has my back as does my team. Sairee Chahal is the Founder, CEO of SHEROES - a community platform for women, offering support, resources, opportunities and interactions via Sheroes.com and the SHEROES App. 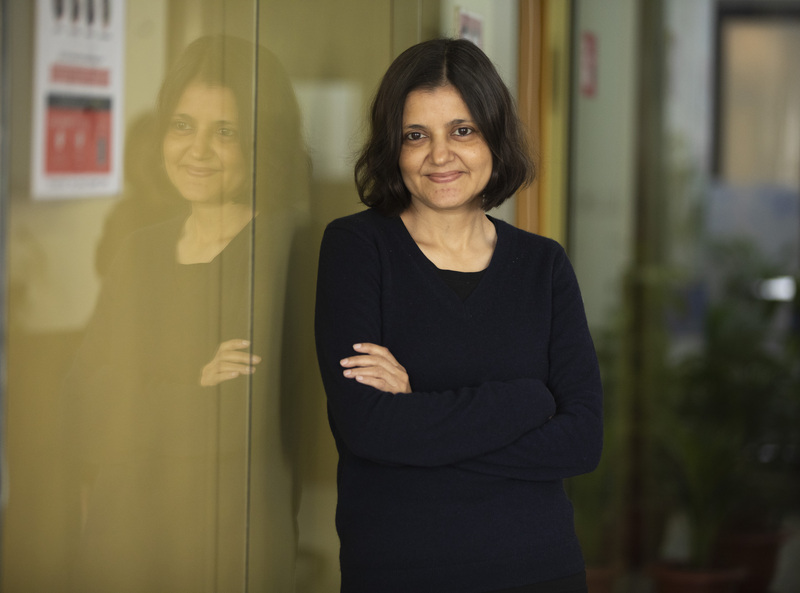 Sairee is credited with building up the Women’s Internet conversation in India, besides building a strong technology play to solve the problems of gender disparity in India. A technology entrepreneur, Sairee has straddled the best of both worlds in her ventures Newslink, Fleximoms and now SHEROES. Her community-meets-deep technology approach has made SHEROES a globally formidable platform, changing the game for women and their aspirations. Over a million women have been directly benefited, and under Sairee's leadership, SHEROES aims to impact over 100 million women in the next five years. An Aspen Leadership Fellow, Sairee is also the convener of The SHEROES Summit – India’s largest women's forum. With an M.Phil from JNU, and a PGDBM from IMT Ghaziabad, Sairee kickstarted her professional career while still in college before cofounding her first start-up. She went on to also work at corporates like Heidrick and Struggles and CII. Recognised for her achievements globally, Sairee is a Devi Award winner, apart from the Femina Achievers Award, Cartier Award, Editor’s choice for L’Oreal Femina Women’s Award, Business Today and Most Powerful Women in Indian Business.